I seem to be reading more and more recently, either poems and articles online or blog posts or poetry collections and poetry magazines. But I don’t feel that I’m properly reading anything, not really absorbing the words, as if my head is just too busy and full to take very much in – and then another book comes out or another magazine lands on my doormat or another article flashes up on my Twitter feed. I almost want to freeze the world so that I can catch up on reading everything I’ve half-started before the TBR pile, actual or virtual, grows even bigger. I’ve bought several books recently, among them Rebecca Goss’ new collection, Her Birth and the collected stories of Lydia Davies, that I haven’t even opened yet. One way to slow myself down and to improve my focus, I hope, is to attempt to write some reviews of books. I’ve wanted to do this for a while but I’ve lacked confidence and I’ve kept putting it off. I wrote a review of Anthony Wilson’s Riddance here but nothing since. Recently I’ve been encouraged by reading articles about reviewing by Emma Lee and others and I’ve decided to stop procrastinating and get on with it. I’m a slow reader and writer so no need to fear a deluge. I’ve been carrying Hilda Sheehan’s book around with me for several months so I thought her book would be a good one to start with. I confess to knowing Hilda and liking her enormously so don’t expect a hatchet job. As you might expect from the title, there is a showing of films in Hilda Sheehan’s debut book of engaging and varied poems. Butch Cassidy and The Sundance Kid, The Towering Inferno, A Streetcar Named Desire, Planet of the Apes and Westworld all feature in this lively book and the allure of Hollywood adds to a recurring theme of escape. Characters in these poems are often on the move: in cars, streetcars (the same streetcar as Vivien Leigh), even spaceships, and when they aren’t physically travelling, they’re longing to be somewhere else – Manchester and other big northern cities or, if they’ve already reached Blackpool, they’re imagining themselves in Argentina with a different dancing partner. but that’s just plain neglect. These poems concern themselves with care, rather than neglect, and they understand that acts of caring can be messy, involving shouting, other people’s radio music, everyone talking at once. The author’s biography tells us that Sheehan is a mother of five children and has worked as a psychiatric nurse and she draws on her life experiences to give us a poetry of modern, chaotic life. The Night My Sister Went to Hollywood is an uplifting read. While tenderly alluding to what might have been, the poems haven’t given up on everything that might still happen. This reader, for one, is looking forward to discovering what happens next in the life of Hilda Sheehan and I’ll be searching out her next collection with great interest. 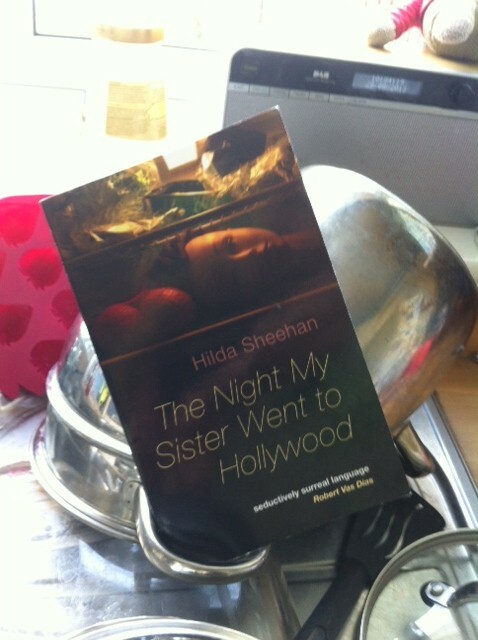 The Night My Sister Went to Hollywood by Hilda Sheehan is published by Cultured Llama and is available to buy here. Read poems from The Night My Sister Went to Hollywood here and here.